Do you like Spacewar.io? Share it with your friends. Spacewar.io is another great multiplayer shooter from the popular series .io games. 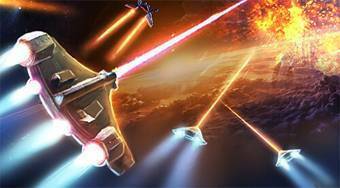 In this game you will be flying a spaceship and your mission is to fly with it in the universe, collecting glowing asteroids to get upgrades, destroying meteorites, and shooting with the spaceships of other players from around the world and trying to get to the top of the top players' table.